It’s approaching high noon for a showdown between the Trump administration and Congress over 3D-printed guns. The Trump administration notified Congress last month that it intended to move jurisdiction for most commercial firearms exports from the State Department to the Commerce Department, a seemingly arcane bureaucratic move that has ignited a firestorm of controversy. 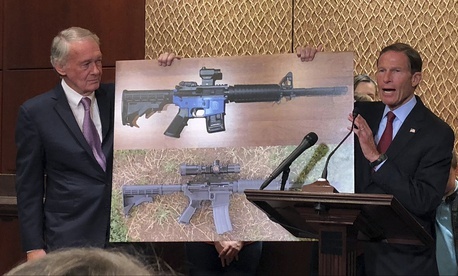 Critics say Commerce’s laxer export rules will allow criminals, terrorists, and human rights abusers access to a host of new weapons — including metal-free “ghost guns” manufactured on 3D printers. In 2013, Cody Wilson, a law student and gun activist, posted the blueprints online to assemble a plastic gun from parts made on a 3D printer. The Directorate of Defense Trade Controls, the State Department office that controls firearms exports, took the position that publicly posting that information was the legal equivalent of emailing it to a foreign government — an “export.” Wilson’s company, Defense Distributed, took down the plans but sued the State Department. Last summer brought a surprise twist: the State Department settled the case for around $40,000 and allowed the plans black online. Hours before they were to be available again, a federal judge granted a request from eight states and the District of Columbia to temporarily block the settlement from taking effect. The State Department gave no rationale for its abrupt reversal, but the Trump administration was pursuing the rule change to shift the authority for the technology to the Commerce Department at the time. A handful of Democrats have sought to use any tool at their disposal to stymie the move. In addition to the Menendez hold, Sen. Ed Markey, D-Mass., has blocked indefinitely the nomination of Clarke Cooper to run the office in the State Department that oversees the Directorate of Defense Trade Controls. Cooper himself appears uncontroversial, and because of the ongoing interagency process, the State Department can’t unilaterally give Markey what he wants to release the hold — specifically that the administration maintain its prohibition on publishing the 3D gun blueprints online — leaving a senior post with a myriad of international responsibilities vacant with no clear resolution in sight. Blocking the rule change permanently would require an act of Congress. Democratic lawmakers are weighing a number of pieces of legislation to address the matter — including blocking the authority transfer in statute and expressly banning posting 3D plans online — but their fate in a Republican-controlled Senate is murky. The change is supported by the firearms industry, traditionally backed by congressional Republicans favorable to more permissive gun laws. Manufacturers believe it will ease regulations and help them boost sales of smalls arms overseas. Some legal experts and arms control advocates argue that trying to regulate plastic guns as an export was never the ideal way to keep them out of the hands of criminals and terrorists at home. While the court blocked Wilson from posting his plans on the internet for free, it expressly permitted him to email or otherwise security transmit them as long as he verifies that the recipient is within the U.S.
“There are genuine issues raised by plastic guns, but they need to be addressed directly, not through export laws designed to keep U.S. guns out of foreigners’ hands without State Department approval,” wrote Clif Burns, an attorney who specializes in export controls.